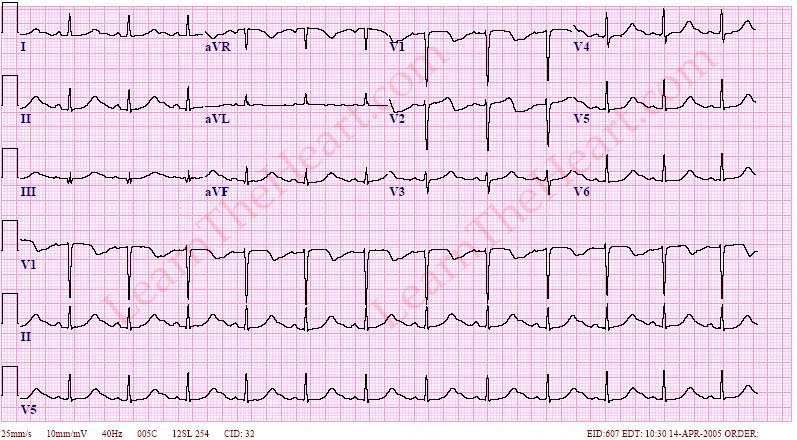 A prolonged QT interval has a variety of causes and can be a very serious ECG finding, as it may lead to the potentially fatal arrhythmia polymorphic ventricular tachycardia (Torsades de Pointes). See the ECG Tutorial section on QT interval to learn how this is measured. Multiple medications, electrolyte abnormalities (hypocalcemia, hypomagnesemia and hypokalemia) and certain disease states (ie, intracranial hemorrhage) can prolong the QT interval. Prolonged QT genetic syndromes exist and include Romano-Ward syndrome, Jervell-Lange-Nielsen syndrome and long-QT 1-13 syndrome. Chou's Electrocardiography in Clinical Practice: Adult and Pediatric, Sixth Edition, Saunders, Philadelphia, 2008. Surawicz B et al. ACC/AHA recommendations for the standardization and interpretation of the electrocardiogram. Circulation. 2009;119:e235-240.